Hampton Park resident and West End Studio Tour (WEST) participant Manju Sah loves sharing inspiration she gets out of nature, particularly from her garden, and this is expressed in her art. “My art is based on what I see. 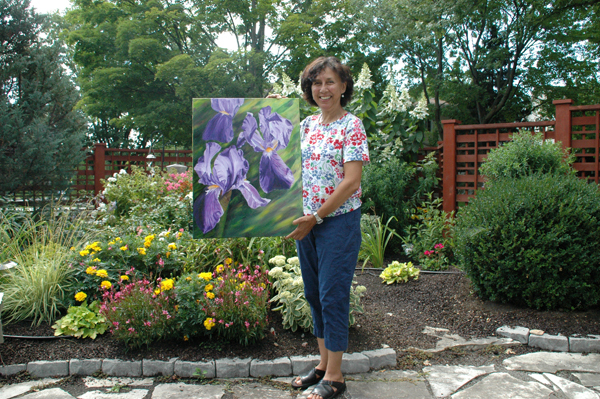 I explore what inspiration my garden gives me and I paint,” says Sah. Motivation to create her art from nature did not come by chance for Sah. Born and raised in Northern India near the Nepal border, Sah spent her childhood near mountains. When she immigrated to Canada in 1974, she attended the University of British Columbia (UBC) and graduated with a Master’s in English Literature. As a student, having those west coast mountains nearby, helped Sah transition into Canadian life. She also felt acceptance amongst her new Canadian friends, which helped her get over the loneliness of being in a new country. Reflecting on her Canadian life and becoming an artist in adulthood, the now retired public servant looks at her work and wants to let people know that good artists don’t necessarily get their start in childhood. As she puts it: age is merely a number. Sah took up art 20 years ago after receiving a box of acrylic paints from brother-in-law and famed American wildlife artist, Joseph Hautman. She was hooked. Sah says studying poetry early in life helped her eventual shift to painting because she realized how closely related literature and symbolism is to visual art. “English is all about expression, and so is art, because a picture says a thousand words.… When I started to paint, it was a direct connection. Art evokes emotion and feelings in people. It’s about communication. I love sharing that connection with people who come to our tours,” says Sah. For more information about Manju Sah’s work, contact her via email at manjusah@rogers.com or go to westendstudiotour.ca.